Thomas Rowley (b 1747 Kingston on Thames Surrey, m Elizabeth, d 1806 Kingston House, Newtown). Thomas Rowley II (b 1794 Sydney NSW, m Catherine Clarkson 1818 Christ Church, Castlereagh, d 1858 Minto). John Rowley (b 1797 Sydney Cove, m Sarah Pear 1819 St John's, Paramatta, d 1873 Scone NSW) <- Not direct ancestor, but an explorer of interest. In 1789 Thomas Rowley was appointed as Adjuntnt by Francis Grose when Francis was tasked with raising the New South Wales Corps (also known as The Rum Corps.). Thomas arrived in Sydney on the Pitt in 1792. He served as Acting Commandant of Norfolk Island, and was one of the half dozen farmers who established Merino sheep in Australia. He had five children by Elizabeth Selwyn, a convict who also arrived on the Pitt in 1792. Thomas was in his forties when he arrived in Sydney, and died in 1806. He and his descendants were prominent members of Sydney society of the day. Although this painting, which is hung at the Women's Pioneer Society in Sydney, is supposed to be Thomas Rowley, there is a doubt. The uniform he is wearing is a naval uniform not an army uniform, and was not designed until after his death. However, there is a remarkable family likeness to some descendants. (Comment by John Gray). Grose receives official warrant to raise the NSW Corps. Recruits to be between 16 & 30 years of age. Grose was 32, Thomas might have been the eldest at 42. 1791 Elizabeth (22 years old) sentenced to transportation for 7 years. 3rd fleet arrives in NSW. Thomas has been working at Chatham Barracks, promoted to Lieut Adjutant..
1794 Absolute Pardon for Elizabeth. Additional 70 acres granted at Petersham Hill and 50 acres at Concorde. 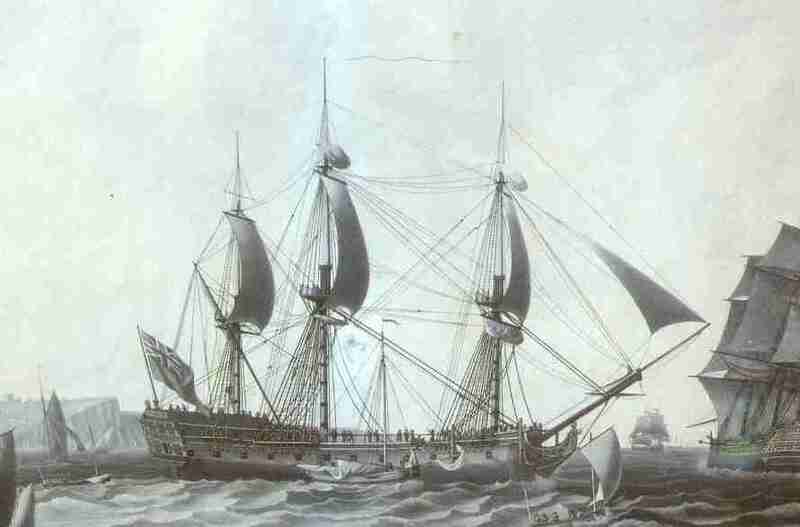 402 convicts, including 58 women were on the Pitt when she sailed from Yarmouth Roads on 17 July.1791. Dr Smee lists 2 Officers, 19 Naval Military, 4 Free persons, 10 soldiers wives, 1 convicts wife, 2 free children, and 5 convict children. This comes to 445 plus crew starting the voyage. Elizabeth Selwyn is listed among the convicts. (Thanks Bob Venn for the Fourth Fleet reference). The only information in the book about the source of this information is that Mrs Nancy Gray transcribed the Pitt muster. It is almost certainly wishful thinking, but if the original document had ages of passengers, it would be very helpful. Another thought - there should be embarkation records for the Pitt in England. There is an interesting description of the voyage of the Pitt in Thomas Keneally's new book "The Commonwealth of Thieves" (pages 399-405) . He adds to Bateson's picture of the voyage. The death rate of convicts on the voyage was one in eleven on the Pitt. They arrived in poor health in mid February, Sydney's most oppressive month,The colony was short of rations as well. Quoting the book, "The record of burials, chiefly of newcomers, during that late summer is sobering. On 16 February, four convicts were buried, and six the next day, and a further six on 20 February. Five were buried the next day, a further two the day after, on 23 February a further six, on 25 February another four- and these just at Parramatta. And so through the first week of March the burials continued. On 8 March there were five male deaths, and on the next day two more and that of a child, Margaret Tambleton. The regular multiple burials of men continued throughout the month. By May 1792, of 122 male convicts who came out in the Queen, only 50 were still alive." All this is a reminder that when we look at convicts in our family tree who prospered, they were the lucky ones. Many perished and appear on no family trees. This image has been scanned at low resolution and heavily cropped. Copies of the print itself can be purchased from the Natioal Maritime Museum in the UK. www.nmm.ac.uk. Signature 2 is the signature of our Thomas Rowley as Adjutant of the NSW corps. Given that Thomas did have a wife Elizabeth on the Pitt, the timing is helpful, as the Pitt sailed in July the same year. An earlier marriage would most likely have produced children, and made athe move to Australia much more difficult to contemplate. Perhaps it was the other way round. The prospect of the move brought on the sudden appreciation of the virtues of matrimony. Planned research from here is to look for evidence that this is not the marriage, eg children in England when Thomas had left. John is of interest in that he was involved in early exploration. the younger Thomas has a separate page. However there are two other possible children. 16.29 Despite the earnest endeavours of many descendants, no parish register record of the birth in 1804, or subsequent baptism, of Eliza Rowley, the fifth child of Thomas Rowley and Elizabeth Selwyn has, so far as I am aware, been located. Perhaps, an explanation is that Thomas Rowley had temporarily abandoned Elizabeth Selwyn and transferred his affection to another young convict lass, Jane Mickle. In June, 1804, Jane Mickle gave birth to a daughter, Mary, who was baptised at St Philip's Church in June the following year. 16.31 Jane Mickle was a convict who was transported on the Nile, arriving on 15 December, 1801. She had received a seven year sentence, and, at the time of her conviction, would have been only fourteen years of age! 16.32 Frank Clune suggest that Thomas Rowley provided for Jane Mickle in his will. This is not so but perhaps the shop and dwelling which she occupied in Phillip Street, the known as �Back Row East�, were provided by him. 16.33 Many a mickle makes a muckle, the Scots say, and it was not long before Jane Mickle became known as 'Jeannie Muckle". "�Mistress Jeannie Muckle' as Dr Lang used to call her in conversation, as far back as 1813, held a wine and spirit licence in Phillip-street." 16.34 In the construction of the first Presbyterian Church in the Colony, Scots Church, Dunmore Lang received considerable assistance from Jeannie Muckle. 16.35 In March, 1826, Dr Lang officiated at the marriage of Jeannie Muckle to Archibald McKellup. McKellup, a leading citizen, was also a publican in Phillip Street. 16.36 Mary Muckle, the daughter of Thomas Rowley and Jane Muckle, married Richard Roberts, on 28 February, 1837. Roberts was the native-born son of two convicts, William Roberts and Jane Longhurst. 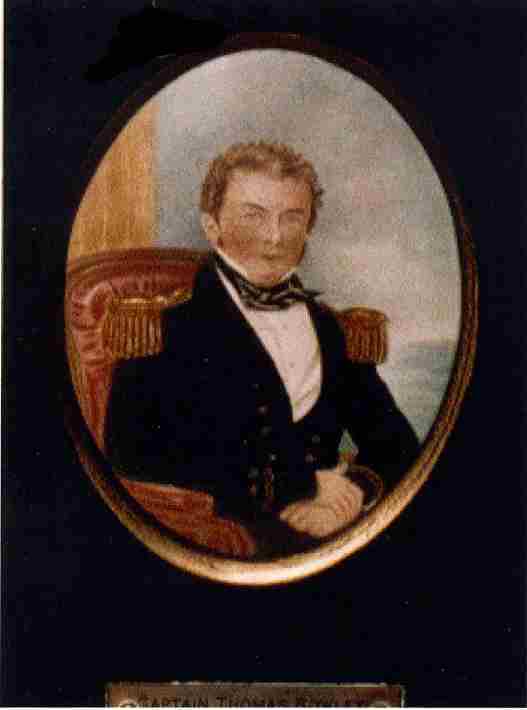 Richard who died within three years of his marriage, on 24 June, 1839, was a well-to-do merchant. Following the death of her mother, stepfather and husband within five years, Mary Roberts was, at the age of thirty-five, a wealthy property owner. She remained unmarried and was most highly regarded as a resident of Sydney-town until her death in 1885. 16.40 Mary Roberts also was "an eminent benefactress to the Scots Church� continuing her mother's generous interest. 16.42 Not all descendants agree with Frank Clune's suggestion that Captain Rowley was the father of Jane Mickle's child. They point out that another Thomas Rowley (Corporal, Royal Marines) who was 39 years of age when he was buried at St Philip's on 20 September, 1822 and who would therefore been about 21 when Mary Mickle was born, could have been the father. In an article published in Australian Family Tree Connections, Alan Hagenson makes a pretty good case for Elizabeth Selwyn being pregnant with a 6th child when Thomas died. (a) In the 1823-5 Muster, Elizabeth Rowley is said to be the mother of Eliza and Henry, Elizabeth Selwyn is listed as Elizabeth Silvin. (d) At his marriage, he states his father is Thomas, and his mother is Elizabeth Sullivan. (a) The same doubt as for Mary Muckle. Thomas was dying of consumption in 1806. (b) One of the suggestions as to why Thomas came to Australia is that he came to keep an eye on a son or relative who was transported as a convict. If this was the Thomas Rowley of the second fleet, it could be consistent with Alan's facts, but it seems unlikely. There is no evidence for a connection. (c) Another longshot with no evidence: Could Henry be Isabella's child, brought up br Elizabeth? Isabella was to cause a minor scandal by marrying William Ellison in May 1807 at age 14 and a half. Perhaps she had a child the year before?. Thomas may well have done his place in history a disservce by his answers to a survey organised by McArthur in August 1805 (again from Cameo, originally from "Some Early Records of the MacArthurs of Camden", MacArthur Onslow p 119). Questn.1st Have you any true bred Spanish Sheep in your Flocks? Ansr. I do not know. Q. ----- 2nd Do you endeavour to preserve the Spanish Breed of Sheep pure and Unmixed with other Breeds ? Q. ----- 3rd What other Breeds of Sheep have you that produce Fine Wool? Ansr. I am no Judge. Q. ----- 4th What Rams have you had in your Flocks and from whom and from what Country did you Obtain them ? Ansr. My first Ram was from California, and my second Two Spanish Rams from Captain Waterhouse. Q. ----- 5th Do you think Breeding the Pure Spanish Sheep will be profitable to you as if you bred other kinds? Q. ----- 6th Do you think the Wool of all kinds of Sheep Improved in this Colony? Ansr. I think it does. Q. ----- 7th How many Sheep do you possess at this time? Ansr. Males 219 and Females 300 - Total 519 Sheep. Q. ----- 8th How long do you suppose it will be before your whole Flock will be Increased to twice their present Number? Q. ----- 9th What means have you adopted to Improve the Carcase and Fleece of your Wool? It should be borne in mind that Thomas was probably very sick at the time (He died within a year of consumption). To me though, it reads like a typical farmer's response to a government survey. Claude Rowley was Thomas Rowley's great great great grandson and a sheepfarmer, and when Elsie, Claude's wife saw the above, she said that is exactly the kind of answers Claude would have given.It might also be true that MacArthur had the connections and self promoting ability to make sure he got the credit anyway. �When I arriv'd in the Reliance at Port Jackson in 1795, Simeon Lord was a Convict in the service of Capt. Rowley of the New South Wales Corps or had just left him, either his time of servitude being out, or he was emancipated. From his good conduct Capt. Rowley told him if he set him up in any business he would assist him; in consequence he commenced Baker & retailer of spirituous liquors, & I am told he got himself taught to read and write." 11.03 In the period 1788-1813 which encompasses Rowley's stay, the island outpost initially comprised well behaved convicts and a small guard. It was not, during this period, regarded as being a place of further punishment or banishment. This is not to say that by to-day's standards, cruelty did not often occur although it did not sink to the level of that shown on the mainland. 11.16 Rowley succeeded to the command on 12 November, 1799. �It seems that by this time the inhabitants' taste for liquor had become an increasing problem. Lieutenant-Governor King mentioned in his 1796 report that some convicts habitually bartered their clothing and other necessities with the settlers and soldiers for spirits. John Turnbull, who visited the island around 1801, also commented on the drunkenness of the inhabitants, noting that some were often intoxicated for a week on end. In 1799 the people suffered a period of ill-health, brought on, according to the surgeon, by drinking spirits hot from the Norfolk stills. Captain Rowley ordered the stills to be seized, and for this was indirectly threatened with prosecution by two of the owners. " Thomas departed Norfolk Island June 1800, having resigned due ti ill health. Elizabeth Selwyn presumably did not accompany him, as Mary was born Mar 1800 in Sydney. For a discussion of the will in relation to Elizabeth Selwyn, go to her page. 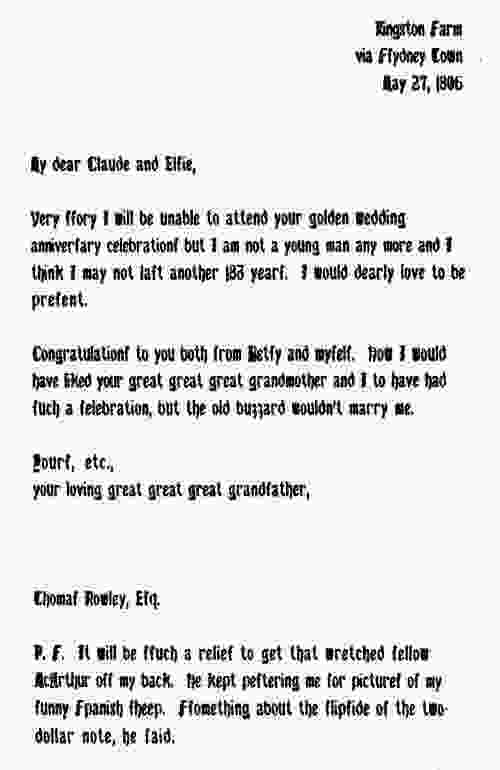 The following telegram is the last known communication received from Thomas Rowley. It was received by my parents on their Golden Wedding. Just about all the material here has been supplied by other researchers, and we are very apprecitive of the gift they have given us. (0) A search of the internet is dissapointing. The main Thomas Rowley located is a poet, and references to our Thomas are brief. (1) A Cameo of Captain Thomas Rowley � Ian Ramage. 200pps on Thomas and his descendants. (2) Harvest of the Years, Dunlop.. History of the Sydney Suburb Burwood. The land was originally granted to Thomas Rowley as a farm. At the end are two maps showing the farm and the suburbs today. (3) Merinos Myths and Macarthurs., J.C.Garran and L.White. Thomas Rowley as one of the half dozen who introduced merino sheep to Australia. (5) Life and Work of the Pioneer Captain Thomas Rowley, Huntington, H. W. H.
(7) The Convict Ships, Bateson. Also have you seen this book online, which seems to suggest Rowley imported the first thoroughbred horse to NSW. Quite a good story with the spring carnival coming up!